Former US President Bill Clinton has met the leaders of Northern Ireland's power-sharing administration in Derry. During a speech on economic prosperity at the Magee campus of the University of Ulster, Mr Clinton said the next challenge for the peace process is to create an economy in difficult times that serves all the people. His comments came ahead of an upcoming investment conference in Washington next month. The conference will be hosted by US Secretary of State Hillary Clinton on 19 October. It is aimed at boosting Northern Ireland’s economic prosperity at a time of rising job losses and impending cuts to public sector spending. During his first visit to Derry in 1995, which came a year after IRA and loyalist ceasefires, Mr Clinton spoke about the economic rewards of peace. In today's speech, he told local politicians and business leaders that working on the Northern Ireland peace process had been one of the greatest honours of his life. 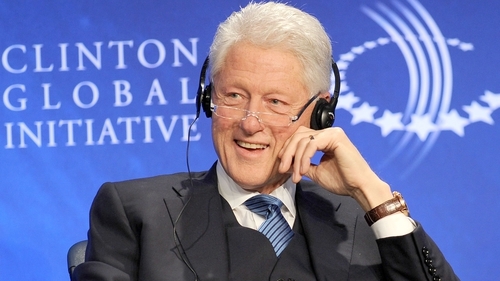 Mr Clinton was to travel to Dublin this evening to open the Clinton Institute for American Studies at UCD.